The focus of my blog is to review book series and not individual novels, but writers are going to continue writing novels within a series even after I have done my review, so I plan on reviewing the individual novels as they come into circulation. J.T. 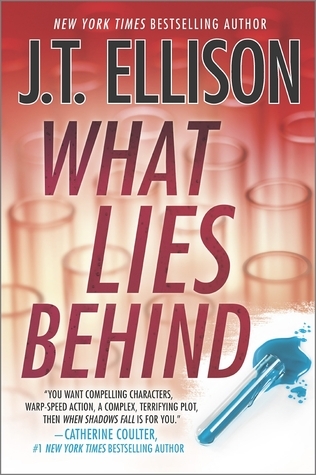 Ellison just recently added book #4, What Lies Behind, to the Samantha Owens series. If you are looking for some fun summer reading, J.T. Ellison’s newest book in the Samantha Owens series, What Lies Behind, may be just what you are looking for. The main character Samantha Owens is a medical examiner turned FBI consultant. Originally from Tennessee, she relocated to Washington D.C. after meeting her lover Xander Whitfield, a former army ranger. The story begins with a murder and potential suicide that has occurred in Owens’ neighborhood. Homicide detective Darren Fletcher is called to the scene and Fletcher, who has worked with Owens’ on previous cases, calls on Owens to get her opinion on the murder scene. While canvassing the scene, Owens comes across some significant biohazardous material and what seems like a straight forward murder/suicide case, explodes into something more sinister. While Owens is busy worrying about being exposed to some nasty bug, her lover Xander Whitfield is working on a job through his newly established security protection firm with his partner Chalk. The job is to protect British industrialist James Denon and in what seems like a straight forward job, turns out to be the beginning of a nightmare. Assassins, bio-threat, subterfuge, and good ole fashion detective work are all a part of JT Ellison’s latest thriller which makes for several hours of fun entertainment. In my review of the series I have expressed that the series is more of a romantic thriller with a veneer of forensics but in this latest addition, I would say that this particular thriller is more a of a spy/disaster thriller. Though Whitfield and Owens do a little ogling with each other, it is kept at a minimum because they are too busy trying to save the world. Ellison has also included a subplot, which includes a creepy psychopath and appears to foreshadow the next installment to the series. It is a little confusing at times because it seems to be related to events that are taking place in this novel, however, it becomes clear in the ending what is really happening. It is not really necessary to read the previous novels in the series, but if you want to really understand the background of the characters and how they relate to each other, I would recommend reading the first book in the series, A Deeper Darkness. To learn more about the series check out J.T. Ellison’s Samantha Owens Series. Posted in Spy Thriller.Tagged Book Review, Book Review Blog, Book Series, books, JT Ellison, Samantha Owens, Spy thriller, Thriller.